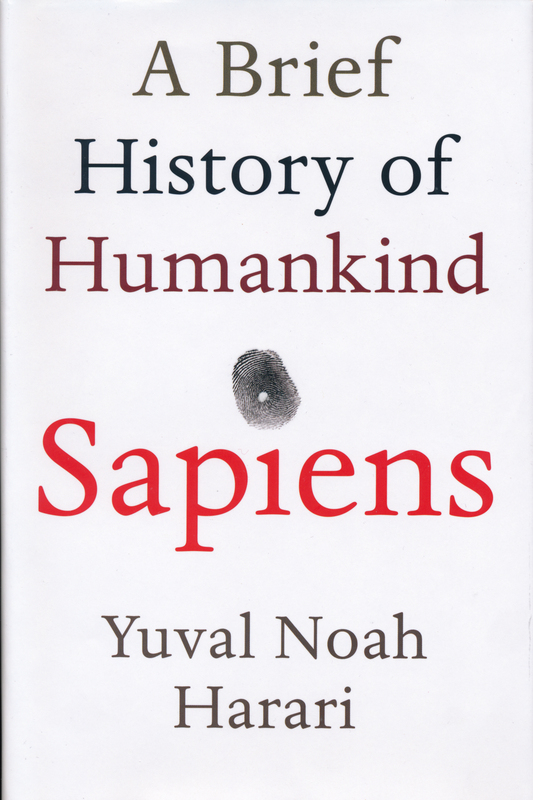 Yuval Noah Harari’s Sapiens: A Brief History of Humankind has proven to be one of the most thought-provoking non-fiction books published in recent years. It’s such a stimulating book that I reread it recently. An Israeli professor, Harari is more of a populist and synthesizer than a scientist; using many varied sources from the natural sciences and evolutional biology, he presents a stimulating summary of human history from the Stone Age to the present. Despite a scarcity of detail from prehistoric times, he fills in the shadows of humanity’s long history with (mostly) credible scenarios. The story begins 2.5 million years ago with the emergence of the genus Homo in Africa and the first stone tools. Fast forward two million years and we see the emergence of the first Neanderthals in Europe and the Middle East and, about 300,000 years ago, the common use of fire in daily life. The next big jump occurred 200,000 years ago with the emergence of our own species, Homo Sapiens, in East Africa. But Homo Sapiens really weren’t people like us until the Cognitive Revolution of about 70,000 years ago, when fictive language emerged; that’s when our forebears began to spin out myths, legends, gods and religions that united biological tribes into much larger social units. As Sapiens spread from land mass to land mass, Neanderthals and various other human species who came into contact with them inevitably and rather quickly met their demise. So did the large monstrous animals, from mammoths to giant sloths, that once roamed the continents. The evidence credibly shows that early hunter-gatherers hunted them to extinction. Twelve thousand years ago, the Agricultural Revolution and the domestication of plants and animals further transformed the social order, allowing cities, kingdoms and money to develop. Harari notes the rise of the first empire, the Akkadians, about 4,250 years ago, and the emergence of Buddhism as a universal philosophy meant to unite masses of people. His timeline also includes the innovations of Christianity and Islam about 2000 and 1400 years ago, respectively. Hariri holds that Man’s ideas about God and human rights, for example, are just conceptual in nature, mere constructs of language. It isn’t surprising, therefore, that he downplays the Jewish contribution to civilization. His timeline doesn’t mention the rise of Judaism, monotheism and the Hebrew Bible as seminal events that shaped history. That seems a glaring omission, rather like writing a history of the motor car without mentioning Henry Ford or the Model-T.
Ironically, Jewish-derived ideas and motifs are subliminally embedded in Sapiens in the form of chapter names and headings: for instance, The Tree of Knowledge, A Day in the Life of Adam and Eve, Noah’s Ark, The Flood, and Building Pyramids. It’s as if Harari is acknowledging the centrality of these Biblical stories and concepts to our culture while not giving them a nod explicitly in the text. Harari seems to believe that humanity’s golden age was in a dim, distant past at a time when we were nomadic gatherers of food. 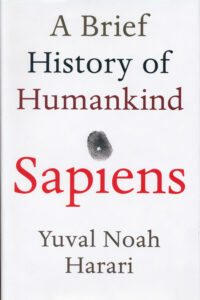 Homo Sapiens were banished from the equivalent of Eden, he seems to suggest, the moment they began to cultivate wheat. According to this Israeli scholar, wheat manipulated human beings to its advantage to become the most ubiquitous plant species on the planet. Wheat was the master, humans the slaves. By this entertaining and clever reversal, Harari seeks to persuade us that the lot of humanity massively deteriorated when we switched from foraging to farming. “Rather than heralding a new era of easy living, the Agricultural Revolution left farmers with lives generally more difficult and less satisfying than those of foragers,” he writes, describing the false promise of agriculture as “history’s biggest fraud.” But the evidence that Harari presents is questionable, and many readers will remain skeptical. Harari repeatedly asserts that the way we live now is unnatural, but his arguments are occasionally weak. For instance, he compares the labour-saving innovations of agriculture to today’s time-saving technologies, arguing that the result is more work, not less. The age of “snail-mail” meant slower and more thoughtful communications; whereas today many of us are besieged with a flood of daily e-mails demanding swift replies. “We thought we were saving time; instead we revved up the treadmill of life to ten times its former speed and made our days more anxious and agitated,” he complains. Harari’s theology of victimhood gets especially tedious in the second half of the book, which focuses on that “root of all evil,” money, and how it further enslaves us (except, perhaps, the famously perfidious “One Percent” at the top, those fat cats who, in popular contemporary opinion, lord it over everyone else). Here Harari gives full rein to his Marxist-leftist sympathies. His views, like those of Naomi Klein, seem to dovetail nicely into the modern left-spun mythos of Man as victim in hopeless servitude until he throws off the burdensome yoke of heartless capitalism. While most agree that Sapiens is a compelling and engaging book, many scientists have disparaged its findings as unscientific. After Harari so brilliantly describes human tribalism, it’s disappointing to see him embracing the sacred cows of one particular modern faction. It’s certainly understandable why his book has attained such mass appeal (which its followup volume, Homo Deus, has failed to do).